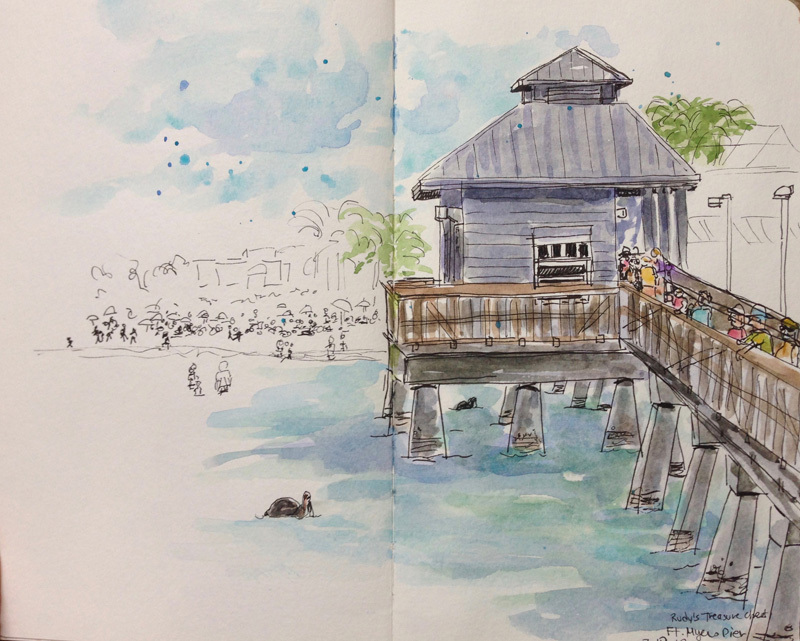 I sketched some additional places of interest on my Fort Myers Beach vacation. The picture above was sketched at the pier. This long pier on concrete pylons led to a large area at the end (where I was standing) and people were fishing, watching seagulls and pelicans and the parasailing taking place in deeper waters. This area was a hubbub of activity and as I looked back to the beach, there were many people on the sand under brightly colored umbrellas. I chose to focus on the pier, thus leaving the background colorless. The wind was blowing very hard and a fisherman came up to me, as his line had blown across the railing near me and he wanted to untangle it. A bit closer to home—- this sketch was done while sitting under some palm trees in front of our condo. I was looking to the right to an adjacent condo complex and noticed their Tiki huts and lamp posts near the beach, so I did a quick sketch of those as well. This sketch of the drawbridge over San Carlos bay was done while I was sitting on a beach chair looking south from our beach. I had driven over the bridge several times from Lover’s Key to Estero Island where we were staying. We had spent many wonderful moments walking over the bridge, under the bridge, and observing boats, people jet skiing, fishermen, and some very playful dolphins who swam up and down the bay under the bridge. Finally, I sketched at a marina where we were having some iced Chai tea at a local bistro. I liked the large yacht up on a rack and watched as a red forklift puttered around other boats, stacked up on racks like a parking garage. I marveled how a forklift could lift a yacht and carry it around like a baby in its mother’s arms. I had never seen how those boats were moved before, and it was interesting!